Delicious??? What the hell IS it?!?! August 4, 2005 by Rick, posted in WTF!? My co-worker directed me to this website today. The author, one Wendy McClure (a Chicago girl! ), has displayed her mother’s (or her grandmother’s, she isn’t quite sure) 1974 Weight Watchers recipe cards for all the world to see. But if that isn’t funny enough, she writes some of the most drop-dead hilarious comments for each one. I nearly fell off my chair I was laughing so hard. I know there were some weird fad diet foods in the 70s… but this takes the cake! 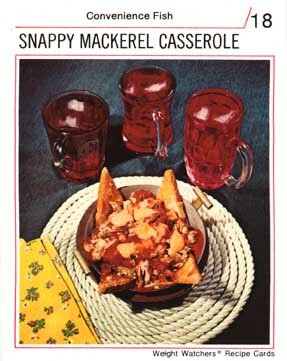 Or the Snappy Mackerel Casserole, if you will. Click on the above image to see more. You’ll be glad you did! Previous postIs summer over yet?